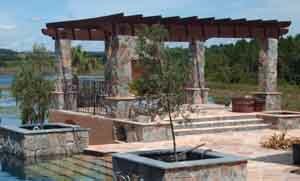 Landscapes by Land Art LLC offers full service general contractor services of our Florida licensed general contractor. Please take a moment to review this section to learn more about our general contracting services. Be cautious and never use a handyman that does not have the proper credentials for your construction needs. A handyman may tell you that he is able to do items that he is not legally allowed to perform according to the State of Florida. There are popular websites where these handymen lurk, offering a slightly lower price than a licensed contractor, yet never carrying the insurance or licensing requirements that are required by the state. Protect yourself and always ask to see the license of professionals that you will be contracting with in the design and construction industry. Florida licensed general contractors and other Florida licensed professionals will always be happy to share their credentials with you, and glad that you asked. Unlicensed handymen will appear or act offended, giving themselves away. Enhancing your quality of life has never been easier than with Landscapes by Land Art . Our one stop "concept to completion" services at industry competitive pricing allows you the trust and freedom to design, construct and maintain your outdoor living enviroment with one call. Adding a paved surface area to your property adds valuable living space to your home or commercial building. Our paved surfaces services and Orlando paver services are discussed in the paver section of our website. You may wish to add an overhead structure such as a pergola or trellis to your outdoor living space. Our Florida general contractor will construct your dream structure for your. 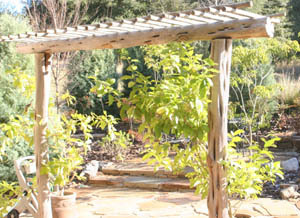 A pergola or trellis will provide a structure to grow vines upon, shade relief from the harsh Orlando sun and an area to group furniture and gather for social events. Your overhead structure may be open air or solid, depending upon the rain protection that you desire. Our design staff can help you design a structure to compliment the architecture of your residence, thoughtfully selecting materials that are readily available to contractors in the Orlando area, or special ordered from afar to authentically compliment your design style and taste. Summer kitchens have always been a popular addition to Orlando estate landscapes. With more affordable options available in Orlando, many modest homes are begginning to see summer kitchens pop up in their outdoor living space. Our Florida general contractor can construct the summer kitchen that you desire to enhance your outdoor liviing space as well as save you money by reducing your air conditioning expense during the warmer Orlando months. The latest trend in outdoor living is the addition of a wood fired pizza oven. A wood fired pizza oven will add hours of enjoyment to your outdoor living space, and you will become the place to congregate for good food, fun and relaxation. Outdoor pizza ovens are not limited to baking pizza, you will enjoy discovering new breads and other baked goods as you experiment with your new oven constructed by our Florida licensed general contractor. The interior componant of your wood fired pizza oven will be provided by FOGAZZO or a other qualified company, we will design and construct the outer decorative skin for your oven to your specifications. For those cold winter nights we suggest an outdoor fireplace, a two sided fireplace connecting your indoors with your outdoors or a firepit. All of these structures can be designed by our design staff and constructed by our Florida licensed general contractor. 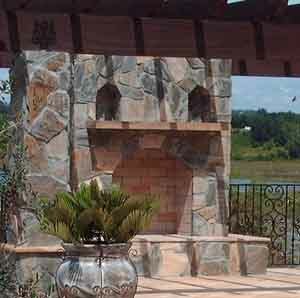 A thoughtfully placed outdoor fireplace can screen unsightly views or provide a focal point to terminate a view. A two sided fireplace will connnect the inside of the home with the outside living space. A firepit will be less formal in appearance and less massive, providing a casual gathering space. These structures can be designed and built by our educated and experienced design and construction crews at Landscapes by Land Art LLC. 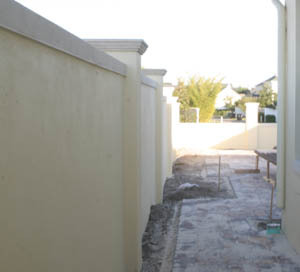 A utilitary addition to Orlando and central Florida outdoor living spaces is a wall. Walls can serve many purposes, to hold back a change in grade or elevation, perimeter walls will provide privacy for a large space, intimate walls create a private space on a smaller scale for areas such as outdoor shower, reading nook, spa enclosure or to create a courtyard. Walls may hold overhead structures up or may connect structures together. Short walls will provide a place to sit and gather. Walls can have a variety of construction methods and surface treatments. Dry stack walls can be used for a terracing effect. Stone walls can provide a sense of age, brick walls can be used to create interesting surface planes when covered with living vines, and stucco covered walls can create a sense of simplicity that will not overtake other architectural elements. 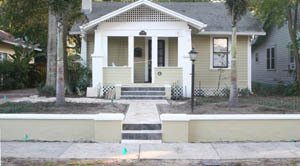 Wall caps can be of varying materials to include natural stone, cast stone, or stucco to name a few. Further interest can be provided to a wall through the use of niches or bee bole design alcoves, which can be used to create a space to put a lamp, sculpture or other item of interest. You may choose to add a window or portal into your wall to provide a focal point, to direct a view or to provide a backdrop of greenery giving a sense of the wild beyond. No matter what you desire in your new wall, our design and hardscape general contractor will help you fulfill your dreams. Orlando properties that are lake front may benefit from the addition of a sea wall or boat dock. Our marine general contractor can handle all of your waterfront needs. 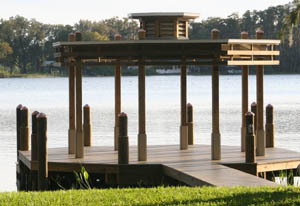 Our landscape architect will assist you with the design of your boat dock, boardwalk or sea wall. Not all boat docks are created alike, the tiresome rectangular structures that surround Orlando and central Florida lakes are dated to say the least. Our landscape architect has a portfolio of boat dock designs that are unique and is prepared to design your new boat dock to suit your boat, your sense of style, and to compliment your architecture. 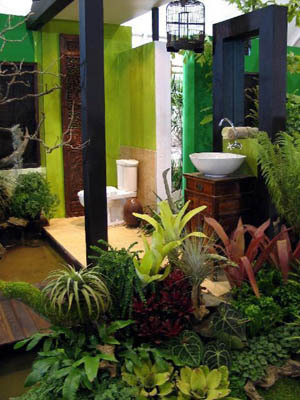 You might think about adding a new outdoor shower or outdoor restroom to your property. There are many different options to think about when adding a outdoor bathing facilty to your Orlando residence. Our Orlando general contractor can handle all of the technical aspects of this challenge. You may desire a formal romanesque appearance to your new outdoor bathing area, or the relaxed feel of a balinese bath. Your new Orlando outdoor bathroom and outdoor shower will help keep your home clean of lawn clippings on days when you mow your lawn, provide an additional bathing space for regular use or for when guests arrive and help reduce your electricity bills as when the outdoor shower is used in lieu of your indoor shower, your air conditioning system does not have to work overtime to remove the excess moisture from the air inside your home. Additioally, taking an outdoor shower on cool mornings will invigorate your body and help get you started for your day. Another option to enhance your outdoor living space is a cabana, palapa, gazebo or balinese pavillion. These structures that might accompany a pool are typically covered with a solid roof to protect the user from the elements, may have a bath or changing facility attached to them and of coarse, will provide that valuable extra space to accomodate any function that you may host. An outdoor bar will enhance your gatherings with its convenience and ease of care. Typical outdoor bar areas will have ample seating around a central area, with a television rated for outdoor or damp use affixed to a wall or other vertical element. Some amenities that may be included in your outdoor bar area are an ice maker, sink and refrigerator. An option to be used for larger gatherings is a keg and keg cooler arrangement. If your property has grade change you may opt to include an underground wine celler to store your collection of wines. Our Florida general contractor can construct anything that you desire and that our landscape architect designs. You might think about adding a new outdoor shower or outdoor restroom to your property. There are many different options to think about when adding a outdoor bathing facilty to your Orlando residence. Our Orlando general contractor can handle all of the technical aspects of this challenge. You may desire a formal romanesque appearance to your new outdoor bathing area, or the relaxed feel of a balinese bath. Your new Orlando outdoor bathroom and outdoor shower will help keep your home clean of lawn clippings on days when you mow your lawn, provide an additional bathing space for regular use or for when guests arrive and help reduce your electricity bills as when the outdoor shower is used in lieu of your indoor shower, your air conditioning system does not have to work overtime to remove the excess moisture from the air inside your home. Additionally, taking an outdoor shower on a cool morning will invigorate your body and jump-start your day. These hardscape structure ideas that we provide here are not the limit of our design and construction abilities, yet are simply a start. 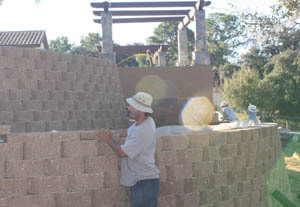 Additionally, we are skilled, experienced and regularly perform the design and construction of playplaces, water features, water falls, fountains, gardening sheds and potting benches, orchid houses, green houses, tree houses, stables, pole barns, equestrian arenas, composting stations, potting stations, porch additions, and many more hardscape features. 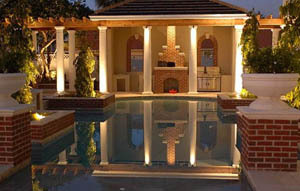 Our Florida licensed general contractor is experienced in all types of construction for the outdoor living space. Please feel free to call us with any questions that you may have about outdoor living space construction at (407) 844-6658.